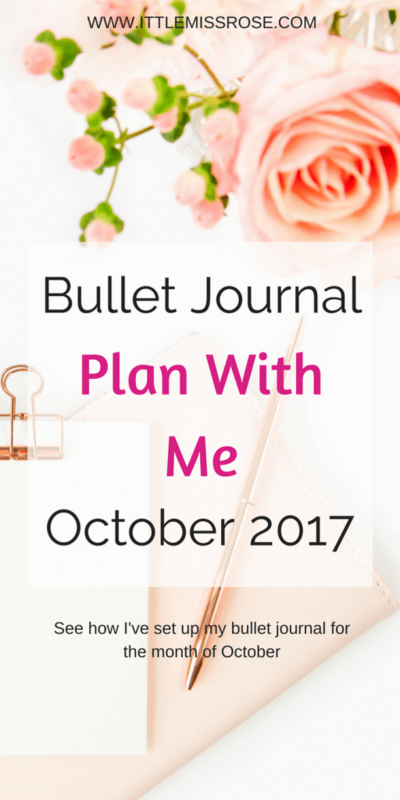 October is literally a sleep away so I thought I’d give you a close-up of my monthly set-up in my bullet journal. 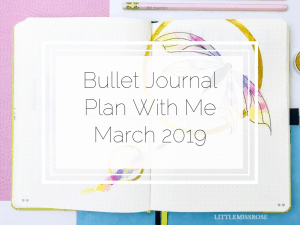 I’d love to do a Plan With Me video for you but I don’t have the equipment to produce a decent video, and quite frankly, I don’t have the time. 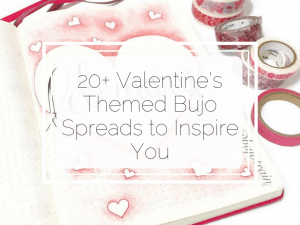 Maybe one day I’ll be able to record one, but for now we’ll just have to make do with a blog post! Next I have my Monthly Log. I went with the double page calendar again because I find the squares easily hold all my tasks and appointments and I can quickly see everything at a glance. I didn’t quite go with the standard calendar though, but staggered my squares randomly. The size of the squares (or actually rectangles) are 6 across by 7 down. Here’s a closer view, with the pen I used which is a Muji gel ink pen. 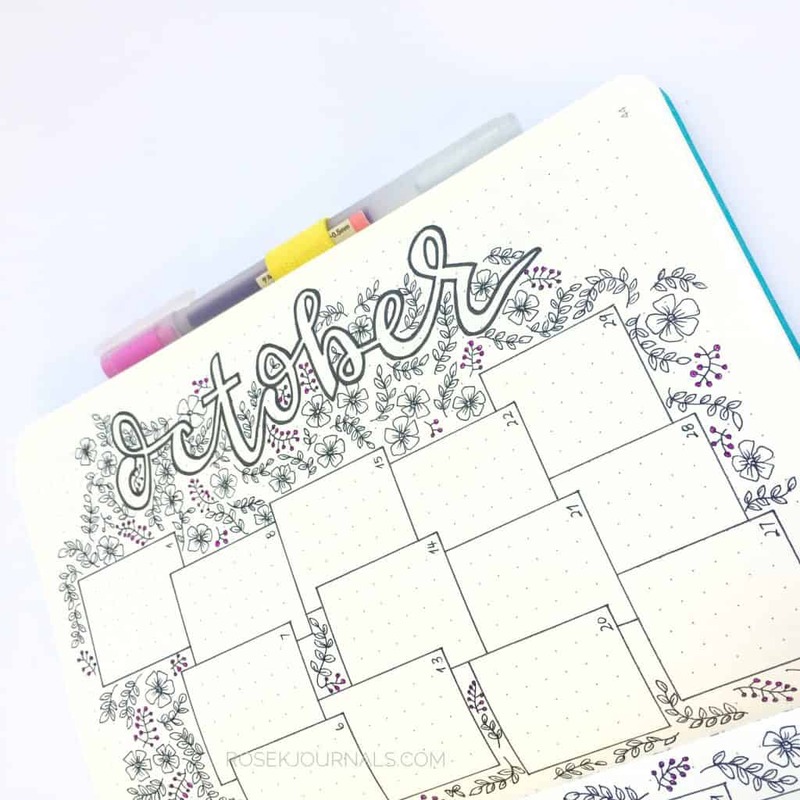 Over the page I have my two spreads that I always have each month. 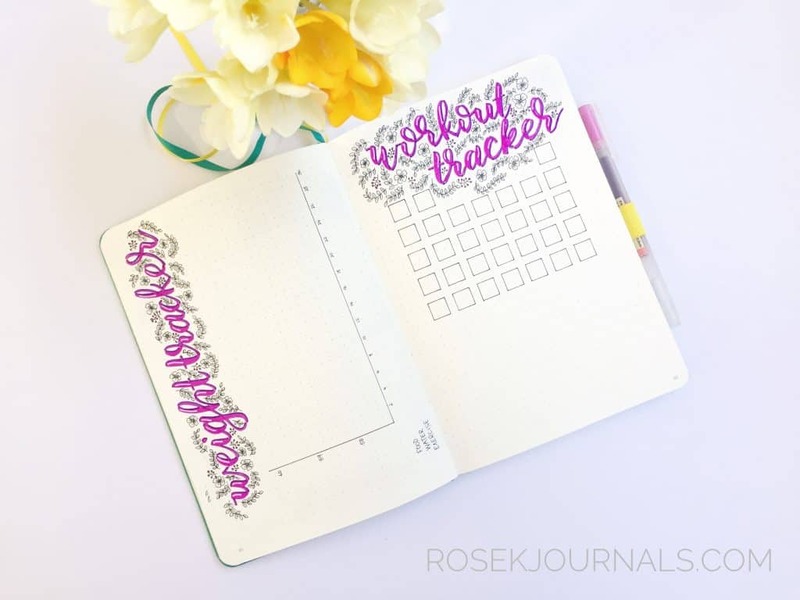 These are my weight tracker and my workout tracker. I know that you are not supposed to weigh yourself everyday when you have the goal of losing weight. But in the tracker I track my weight, how well I ate, if I exercised and how much water I drank that day. I do this by using red, orange and green hearts along the bottom of the tracker during the month to give a quick visual indicator of how good I was, aiming for mostly green hearts. I find that how well I do in these three things does actually affect my weight day to day. The workout tracker on the right hand side will be coloured in with the type of activity I did on the corresponding day, a colour key will develop underneath it as I go. 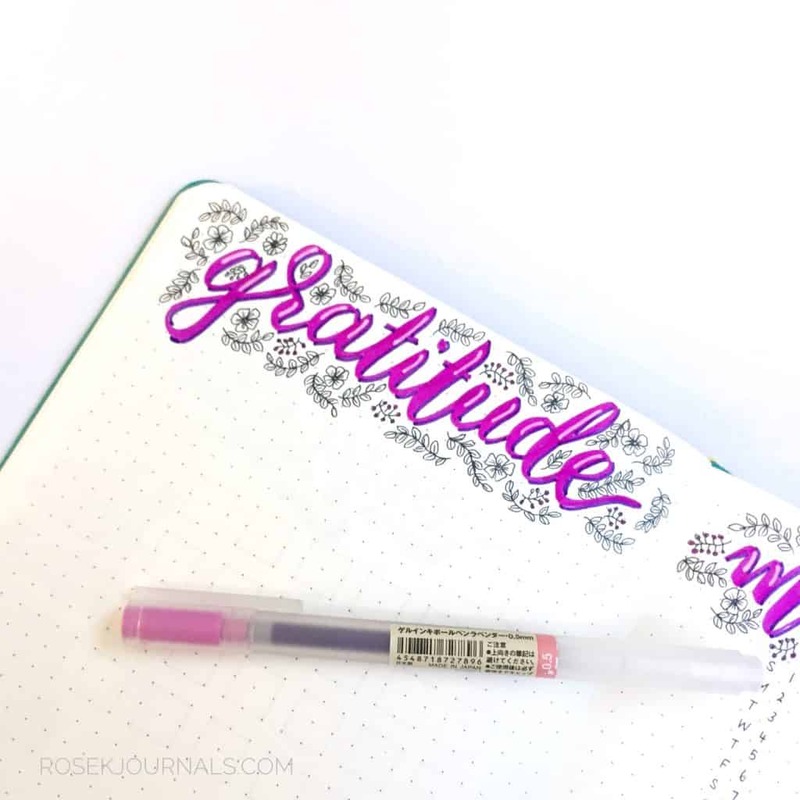 Next is my Gratitude page, I usually call it “One Good Thing Every Day” but I decided to brush letter my headings this month and I cannot get my brush lettering small enough to fit it all in, I still need lots of practice. I will aim to write one small thing each day that has been good and that I’m grateful for. On the opposite page I’ve created a Meal Tracker for our evening meals. To left of the dates I will place a symbol of who cooked or if we went out, and on the right I will note what we ate. 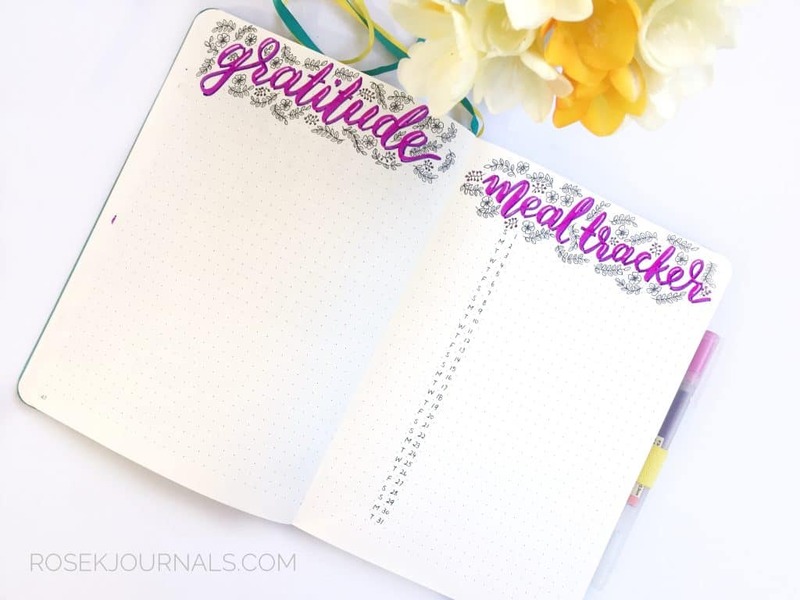 I use the meal tracker mostly as inspiration on what to cook. This seems a bit counter-intuitive but I cook most of the meals in our household and if you’re in the same boat, you’ll understand that it does get hard to come up with new and nutritional meals all the time. I have found that looking back on a meal tracker from a couple of months ago or even the month previous, I’ll find something that I’ve only cooked a few times and remember that it was actually a “hit” and I’ll cook it again. This is especially useful with seasonal foods. One summer you may have cooked a great meal using seasonal produce but because it becomes unavailable over the winter months you may have forgotten all about it the following summer. The meal tracker will remind you of that delicious gem. Next I have my Expense tracker, where I note down all of my personal expenses, rather than household expenses etc. I’ve found that having this has helped my frivolous spending. 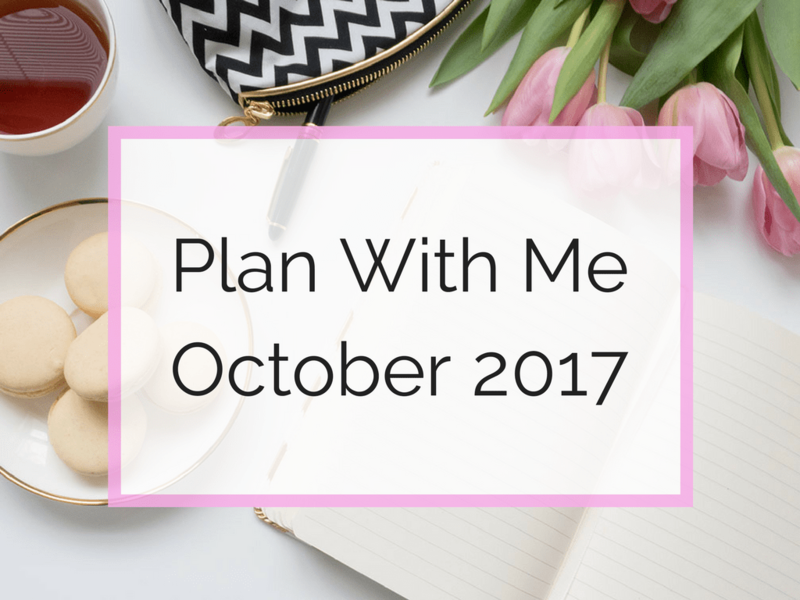 By writing down every time I spent money on food, coffee, stationery, clothes etc I’ve become more aware of wasteful spending habits. I actually don’t think I bought a single latte at all in the month of September! 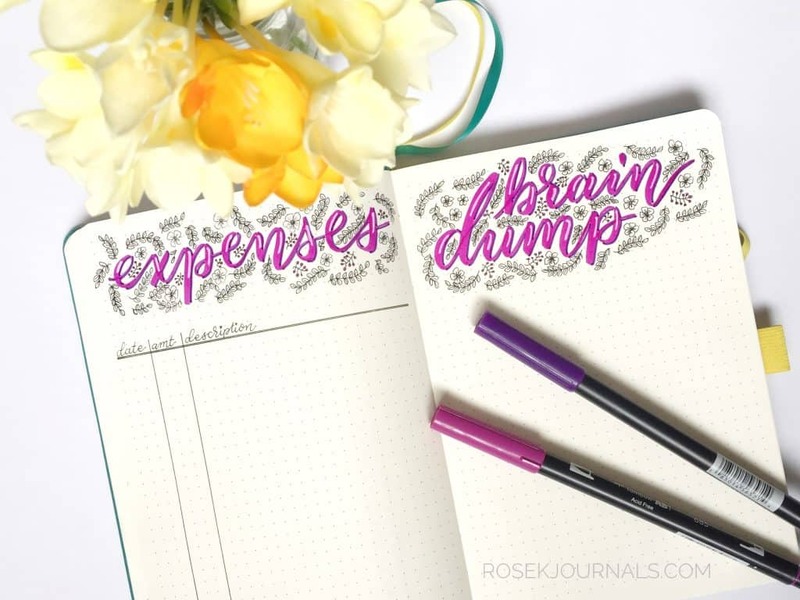 After the Expense Tracker is a “Brain Dump” page. This is something that I’ve seen around for a while but I’ve only implemented it in September. 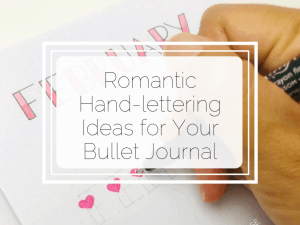 I’ve never done it before because I have a tendency to want everything perfect in my journal. I found myself noting random thoughts and reminders on post-its which all get stuck on the inside front cover of my journal! WTF!?! If they’re going in there, they might as well have their own dedicated page right? Here I give myself permission to be messy and just scribble things down. 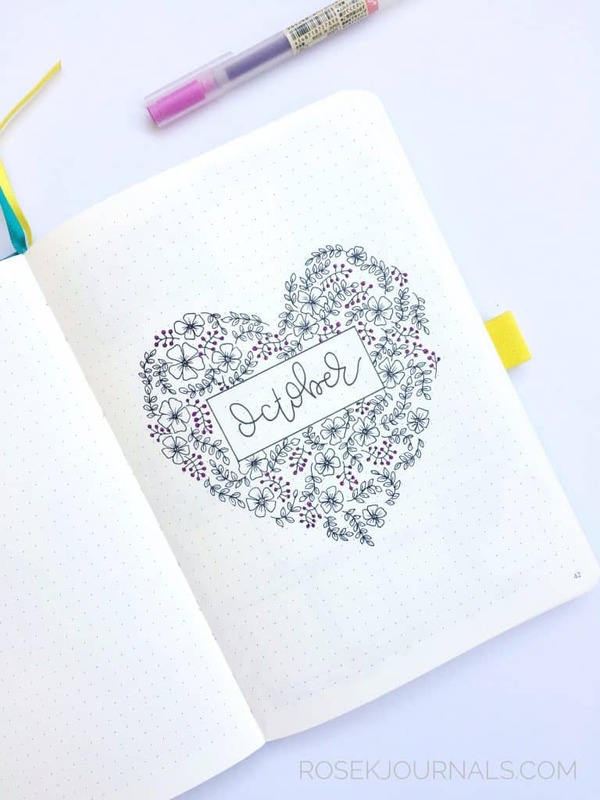 So those are my monthly pages for October. I haven’t quite decided whether I’ll add a memories page or not this month. I’ll decide on the 1st when I come to set up my weekly log for the following week. Here’s a close up of one of my headers. I’ve used Tombow Dualbrush pens for the brush lettering, with the thin end of a darker Dualbrush pen for the drop shadow. 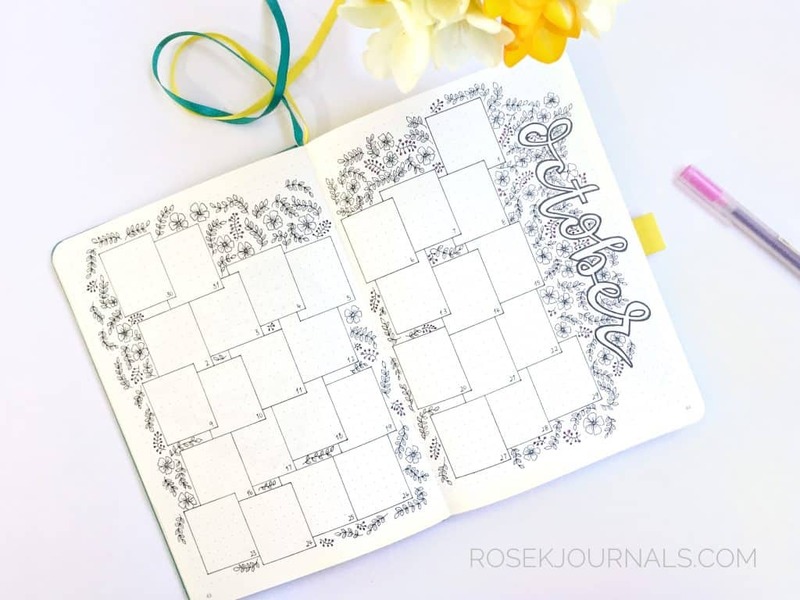 I’ve highlighted the letters with a white gel ink pen and used the same floral design as for my Welcome page. Sorry for the awful photos. Winter doesn’t want to release it’s grasp on us, so there’s been poor lighting to take photos. I’ll try harder next time! 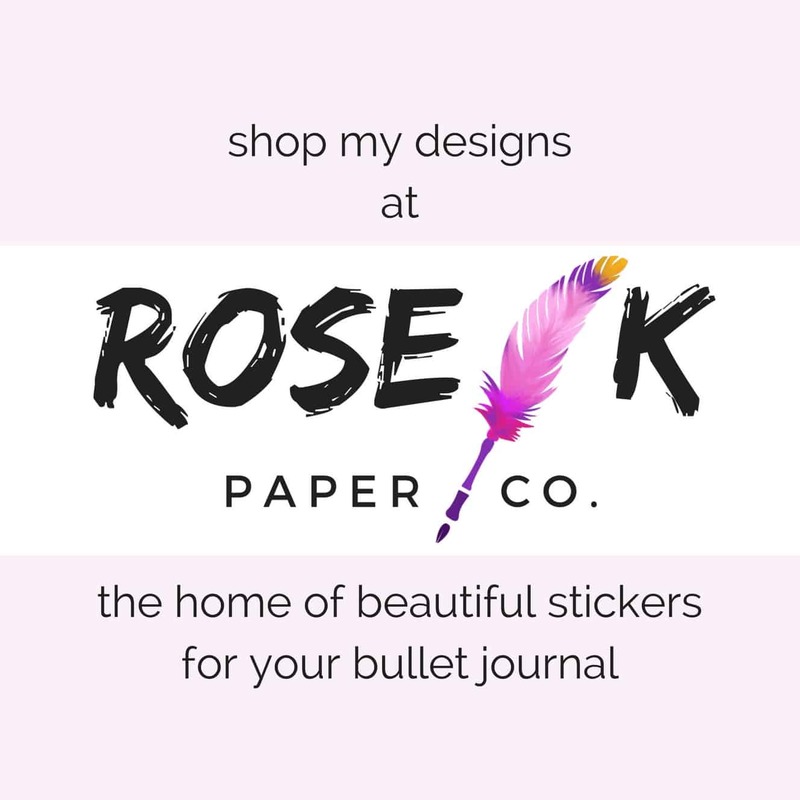 I hope you’ve enjoyed this post, let me know here in the comments or over on Facebook or Instagram. If you have any suggestions on what you would like me to post about please let me know!